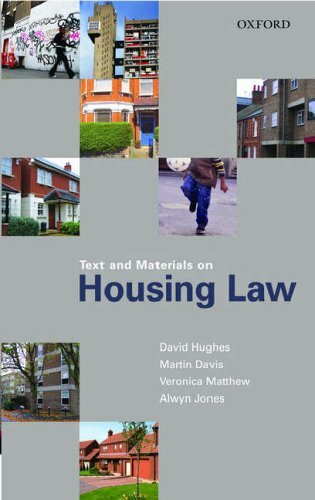 Hughes, Davis, Matthew and Jones: Text and Materials on Housing Law is a collection of housing case law and legislation combined with commentary to enable students fully to understand the often complicated language of the law. It gathers together all the important original materials to which students of housing law will need to have access. Text and Materials on Housing Law Covers housing law topics at undergraduate and postgraduate level Explores the increasingly important area of housing and human rights Deals with housing issues raised by the changing patterns of relationships within society Covers unlawful eviction and the new legislation on homelessnessThe inclusion of procedural material in this work is of great value to housing professionals (local authorities, housing associations, high-street solicitors) and also enhances its usefulness to academics and students by linking the relevant substantive law to a procedural awareness.